Black does not always represent negative or dark forces. For doing a general spell (like you're doing) to protect yourself, it is not a "negative" thing. Heck, when I do cleansings for myself, I dress black candles with my name inscribed right on them! Always remember, it is YOUR INTENT that designates the influence of the candle. So, no, you don't need to do a self-cleansing and you won't bring in negative forces that will do anything to your child. Im trying to get my mother mooch boyfriend out the house. They been off and on for 20 years! Everytime they get back together, its the same old heartbreak for my mom. I want him out of her life and ours for good. He's just plain evil and jealous, he even tried to break up my boyfriend and I.
I heard that a Hot Foot candle dressed with Hot Foot oil can work, but how does the cleaning after the spell work? What kind candle do I need after the Hot Foot to cleanse and protect myself? I moved your post over to the: "Cleansing, Health, Healing, and Blessings" sub-forum. Take a look at the earlier posts in this "Cleansing After Performing Acts of Dark Magick" topic and you will see many ways of cleansing yourself after performing Hot Foot tricks. This guy sounds terrible. I'm so sorry that he is in your lives, disrupting everything. I wish you all the luck in the world. You can take a 13-herb bath and cleanse your house with Chinese Wash. In addition to the candle, I would also suggest getting some Hot Foot powder and sprinkling it where he steps. Hot Foot is a strong contact spell, and although many people now rely on candles to carry their work, the old methods are what this tradition is based upon and contact work is what originally gave Hot Foot hoodoo spells their reputation for effectiveness. thanks a lot Miss Aida and Mama Micki. This is a terrific page (one of my favorites)! Take Care and have a terrific day!!! Three Jacks and a King products are made for winning at card games. You might also try Black Cat to change bad luck to good. Hey Joe49, you could also have your sister help you out. My husband is way luckier than I am, so I have him buy the lotto tickets or pick the numbers. Maybe have your sister get your chips for you or even get your money out of the ATM machine for you. Maybe she can share a bit of her luck with you. Then, just go to the page that I had initially suggested. There are just so many wonderful ideas there. Also, just want to add that you must think positively when performing any magic. KNOW that it already worked before it does. Attitudes are very important when performing any type of spell work. Hoping you'll win lots and lots of money!! I have one particular friend who is very competitive. When we go gambling together, I won't let her sit next to me. One time she kept doing it because I was winning. I suddenly stopped winning. The next time we went to the casino, I used the "I can you can't products" When she sat next to me, she started losing. She no longer sits next to me when we go to the casino. I also do what Miss Phoenix said to do when I'm with someone who is lucky that day and there's no competitive or envious feelings between us. I'm new to this forum so please forgive me if Im posting in the wrong place. I have hired several root workers to perform spells for me - for example a binding spell, hot foot spell, curse spell, court case cow tongue spell. I myself have have done court case cow tongue spell, vinegar jar spell, freezing spells etc. My question is do I need to cleanse. If yes what type of cleansing would you recommend (prefer a simple cleanse). I just want to make sure to protect myself and family. Any assistance would be greatly appreciated. Wether you or a rootworker performs the work for you, you do need to cleanse after dark work (hotfoot, cursing and vinegar jars definitely count). You'll find a number of cleansing techniques in this thread (including the answer I just gave you) so I do suggest you take the time to read it from start to finish. Many workers use a hyssop bath in conjunction with the 51st psalm to cleanse after dark work, 13-herb bath is another popular shoice. Not to simplify matters, but you can also use Salt and "Tell it what to do". Its a cleanser in its own rite. I was just wondering if it will be necessary to perform a spiritual cleansing and purification exercise after I order for a Crossing Virgil Candle Light (against my enemies) to be set on MISC altar on my behalf. You can if you feel that it ought to be done. I plan on doing negative work and wanted to know what is best to cleanse with. After the work I plan on doing some protection. I just need to know what products or kits to purchase because the instructions should be inside...right? Hi que25, I would highly recommend that you read through the pages of this thread. All of your questions are answered in previous postings. I will also add that you can't go wrong with a 13-Herb bath! Last edited by MissMichaele on Thu Feb 06, 2014 12:01 pm, edited 1 time in total. I did the break up spell with feces this morning. But I don't have hyssop on hand for cleansing. Is there any herb I can use that I can buy at walgreens or safeway? Or anything I can use for cleansing that I can find I'm the kitchen? You can order the Hyssop here (http://www.herb-magic.com/hyssop.html) and make your bath when you get the herb. Because this is a Lucky Mojo Product forum we can't really recommend products from other retailers. Alternatively Heartbroken, you can purchase one of the books on Spiritual Cleansing available through Lucky Mojo (or even better, Hoodoo Herb and Root Magic) - they'll go over the use of different herbs you can use to cleanse; many of these herbs available quite easily. I also suggest that in future, you ensure you have all the cleansing supplies you need prior to working hurtful spells. Hi. For the meantime I used egg to do cleansing and reciting psalm 51 since I don't have all the ingredients at the moment. I'll cleanse again once I have it. I have to list first the things i need coz the shipping will be doubled. I ordered return to me but didnt thought what else i need. Thank you for the advice. I really appreciate it. For negative workings can I simply cleanse myself with sage before and after the work and cast my regular protective shield and carry some protective herbs? Sage is an excellent way to start a work. and after the work and cast my regular protective shield and carry some protective herbs? Hyssop is the more traditional way to take off the effects of any sin committed during negative work; as it says in Psalm 51, "cleanse me with hyssop and my sins shall be white as snow." I'm writing this post to learn more about what to put in a cleansing bath that I would need to do before starting any spell work on my end. I want to be completely clear of any bad energies. I heard hyssop is good for this, but what else do I need to do? Thank you. Hi, LM Family, I also have a questions about cleansing before doing any work. I'm in the process of ordering the steady work kit, I don't have a lot of money. However, I do have enough for the kit and a pack of the one day 13 herb spiritual bath. I read under the 13 herb spiritual bath that it's best to use it for 13 days. I can't afford that pack right now, so I'm wondering would the one day 13 herb spiritual bath be enough to get it done. If not is it possible that once I let it steep for the first day can I use it again for twelve more. I'm sorry if this question sound ridiculous but I just want to know, and also will the bath come with instructions. I may get shot down for this, as I could be wrong but, most of my work I don't cleanse before hand unless it specifically requests it. I may do a prayer or have a normal shower or wash my hands but not a full on cleansing. BUT if I do dark work I will cleanse afterwards. Sometimes as simple as smudging myself, especially if the spell is continuing for a few days. at the end of the spell I will do a full on cleansing. I also have a cleansing bath once a week. Sunday, is my preferred day for that. Just suits me. The point of cleansing prior to the work is to start with a clean slate so to speak. If you're already doing routine cleansing and protection, a specific ''before work bath'' is not necessary. A bath suited to the spell work you're doing is then a good way to start the work (and that's included in the spell-kit pinkgirl). the 13-herb bath is used 13 days in a row if there's longstanding issues with crossing or bad luck. For most people to clean up before working if so desired, a single bath is just fine. When doing dark work, it is customary to cleanse as soon as it's done. Smudging is one way, a hand-wash with hyssop or full bath with hyssop the preferred standard in Hoodoo. Like Aura said, if you're already clean, you don't need extra before doing magical work; but it sure does help if your luck has been bad for a long time. And if that's the case, you might follow up with Road Opening or Block Busting. At the Road Opening workshop last weekend,* Apollo Dark made this comparison: Road Opener is like a machete clearing a trail, and is appropriate for most non-magical obstacles; Block Buster is dynamite reducing boulders to rubble, and is often called for when someone has thrown for you. I work overtime every working day with no extra pay, don't have enough private time as I need to learn Japanese, do my art work and sleep. I wanna go home early. You might want to work on your boss. This seems to be the CORE of your problem. Make sure that you prioritize your needs. When performing a boss fix spell, you want a clear and concise command. Wishing you the very best on this. What would happed if I use these on my boss?? Wealthy way: www.luckymojo.com/wealthyway.html (it'll bring you money but, not sure if this will take care of how your bosses treat you). Take the time to read these pages and give you some ideas. Quick question when doing cleansing baths the day you start the bath does that start as day one or is the next day considered day 1. I recently did a divorce spell and for the first few days I was feeling fine. Now I'm going a lot of negativity and anger. I know there can be a backlash of negativity from doing a darker type of spell work. What can I do now to fix it because I feel like it's going to hinder the spell works progress. But generally, if you have done negative work, it is in your best interest to clean your self (at least face and hands) after doing negative work. Praying the 51st Psalm is recommended. Getting a couple to divorce. You might want to give yourself Hyssop bath (it's for forgiveness after performing spells like this). Wishing you the very best with your spells! Thank you for your help! I appreciate it. I at least did the washing, in the shower, while saying the psalm and I already feel better. I'll probably order the hysop, but it'll be a while before it shows up here. Things take forever to show up in Hawaii. Thank you both so much! I will be ordering hyssop for cleansing, but in the meantime I have lots of white sage incense - is wafting myself and my house in white sage smoke a good alternative for hyssop cleansing after shaking a vinegar jar or break up jar? And what's the best thing to use for protection? Much gratitude! I would say "yes and no." Sage has a long history as a cleansing herb, but the Bible does say "Cleanse me with hyssop, and I shall be white as snow." Psalm 51:7 -- the same psalm that says, "In sin I was conceived, and in sin my mother gave birth to me." Sage is a good and reliable general cleanser, but hyssop specifically cleans away any wrong you may have done. So use the sage until your hyssop arrives. I have had mild success with money magic, well I get the money, then shortly there after there are less then ideal repercussions. Ill get a loan, and then banking error over draws my account 3 times that, Ill get unlimited overtime at work, and my wages get garnish from credit I had 10 years ago, Ill win some money on the lottery and never win again. I have tried sugar and cinnamon on the walk way, putting sassafras, cinnamon sticks, almonds in my wallet, $$cc$$ sigal, money pots, gator claw, $2 bills, mercury dimes, fenugreek in jar on the kitchen table, rose of Jericho, tarot readings, all kinds of money washes, Chinese floor wash the house. Thinking I maybe hexed 7 day uncrossing bath, 7 day black candle ritual (disposed of the wax in the river before dawn), purple high john candle, green luck candle, washing the door with vinegar before sunrise, bayberry oil, bayberry candles, load stones, pyrite, fenugreek in the yard, sarsaparilla in the yard, st expedite not only didnt work but the bank error happen shortly there after. I work from home and have done coins on the floor under the desk, dusted keyboard with crown of success, put hyssop in my shampoo (btw thicken your hair nicely), high john in aftershave, bathe with van van soap, guard the house with fiery wall oil, st Michael candles, st martin of Torres, guardian angels... So the money comes then horrible things happen... Im not stealing money, I give to charity frequently, is this personal gain, I know some of it is not embracing offers made, my boss hinted Id be great for promotion, and I for some reason was Eww No, that too much work. Am I cursed with sloth or something? Wow, that is really something. I am so sorry. There's no way of telling if you're cursed without a reading. I suggest that you get one and see what the obstacles are. Wishing you the very best and I pray that you're obstacles are soon removed. Thanks Miss Aida I will certainly give it try, Ive tried divation cards, which can only really tell you that you are cursed, I should really get with reader who can say how to undo it. Got to be better then just tossing the book at it. I'll tell you, I can't read my own cards. Some people can but most can't. No you dont need to cleanse after that if its for good things. 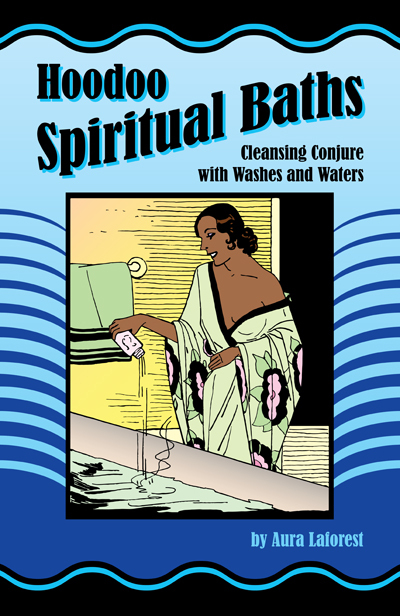 Though you may want to take a spiritual bath for those purposes before the work. Also the book mentioned above is a wonderful asset on learning about baths and the different ways and methods to use them. It changed my understanding of ritual bathing and how to incporporate it in my work. IE not every bath needs to be a tub full etc. Get it you will love it! You can get jinxed during your own work if you're doing Crossing work and it's sent back to you because the target is protected or has done reversing work on you. You can also trail the effects of what you're doing around with you if you do negative work and don't cleanse (see it like playing in the mud, not washing, and then getting the whole house dirty as a result). I wanted to use fan laundry soap or pagoda soap for cleansing. Should I shower or bathe ? And for disposal should it be thrown to the east toward the rising sun? As for praying over the soap before use, can I have an example of an intent? I like bathing because I can relax and say my prayers while my candles are lit. And yes, you would do the same as you would for any other bathing. You could just say the Psalm 23 and then ask God to use this soap for spiritual cleansing. Psalm 23 is a nice one because it covers a lot of bases. You could always just say "Our Father" also. Or pray to whomever is your God/Goddess. Thanks Ms. Aida...so I state my intent and enter the bath..bathing.downward and the moon should waning ?